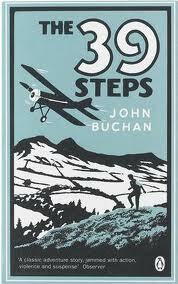 Being a mystery reader, I have to admit that I’ve looked at this reading project as an excuse to read early mysteries, which is what led me to select The Thirty Nine Steps by John Buchan. I was familiar with the film adaptation by Alfred Hitchcock so I figured the original story would be a good read and I was right. The book introduces Richard Hannay, Buchan’s adventurous leading man who went on to appear in a number of other stories. Here, it’s early 20th century and Hannay, just settling into a somewhat boring existence in London after years in South Africa, finds himself smack in the middle of a deep, dark plot to assassinate a head of state. Hannay gets himself into a whole lot of trouble when he allows his neighbor to stay with him after hearing a wild tale about assassination plots and death threats, or at least Hannay thinks it’s a “wild” tale until he comes home to find the neighbor pinned to the floor of his bedroom by a wicked looking knife. The murder makes Hannay determined to fulfill the mission of the dead man – abort the assassination attempt and keep the world from tumbling into chaos and war. Calling on all his wits and cleverness, Hannay makes it out of London and into the wilds of Scotland, where he is hunted by the evil men responsible for the plot, which turns out to be much different than Hannay thought, but still deadly. Saying this is a thoroughly enjoyable read is an understatement. Anyone partial to Robert Ludlum, John le Carre, James Rollins, and even Elizabeth Peters will recognize the seed of these authors’ characters in Buchan’s writing. In fact, Hannay’s tramping through the Scottish Highlands reminded me vividly of Elizabeth Peter’s Legend in Green Velvet, another deliciously entertaining story. Unlike other early 20th century stories I’ve read recently, The Thirty Nine Steps moves fast and doesn’t suffer from the lengthy descriptive sentences found in many works published during this time period. Give this fun, quick read a try and follow it with a screening of Hitchcock’s film adaptation.